We were paid by Bays English Muffins to create this post but, as always, we only share about products we really like. 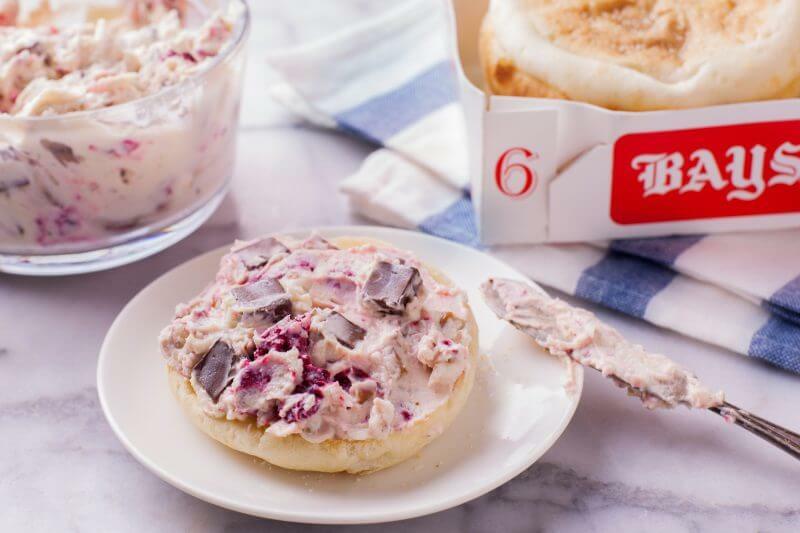 We hope you’ll love their English muffins as much as we do, and are crossing our fingers for one of you to win their sweepstakes! I know how it is mamas, you’re pinching those pennies, making your lists. Doing everything you can to balance the budget for the perfect mix of fun family experiences and meaningful gifts. So how about a chance at an extra $200 for that holiday budget? 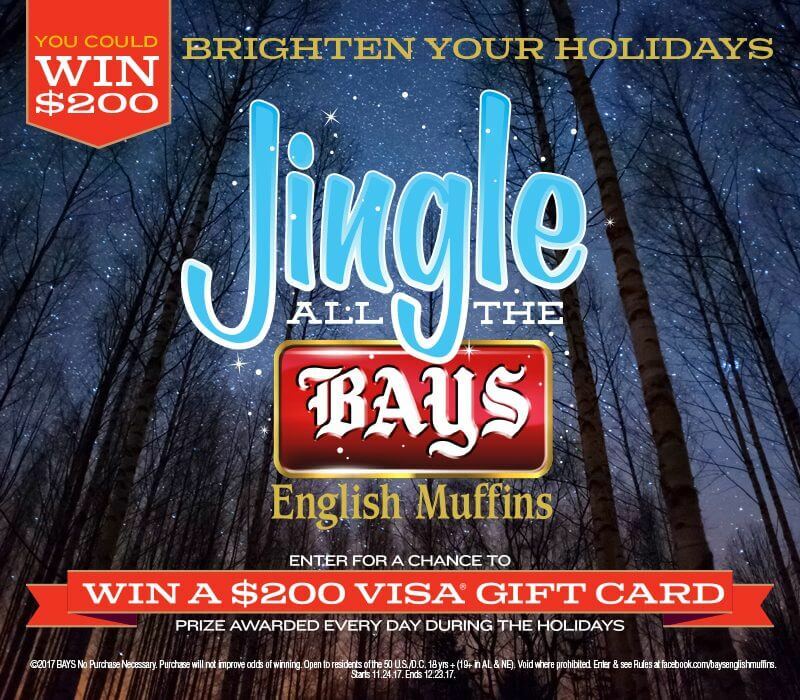 You can enter to win a $200 gift card EVERY DAY between Thanksgiving and Christmas, during the Jingle All the Bays English Muffin event. HELLO holiday shopping! There’s no purchase necessary, just head to Bays’ Facebook page November 24 – December 23, 2017 where they’re giving away 30 gift cards in 30 days! Official rules are at bays.com. And, don’t forget to ‘LIKE’ Bays’ Facebook page, where you can share your Bays creations and pick up some new ideas. Let us know if you win, we’re rooting for you! We love English muffins but had no idea that we could get them so incredibly fresh, until we discovered Bays English Muffins. You won’t find them with the bread, instead they’re kept in the refrigerated section of the grocery store, usually by the eggs. Whether you like your English muffins ever so lightly toasted (like we do), or toasted to golden brown and crunchy, they will end up tasting like they were just freshly baked. There are four different varieties of Bays English Muffins to use in your recipes, or with your favorite spreads: Original, Sourdough, Multi-Grain and Honey Wheat. Not sure what you’ll do with so many choices? We have a whole list of recipes for you a little further down! I got inspired by Bays’ chocolate chunk cheesecake spread, and swapped out a few ingredients to make this decadent, whole ingredient, chocolate raspberry cheesecake spread. Although Washington gets quite cold in the winter, we live in the valley and don’t get a lot of snow. 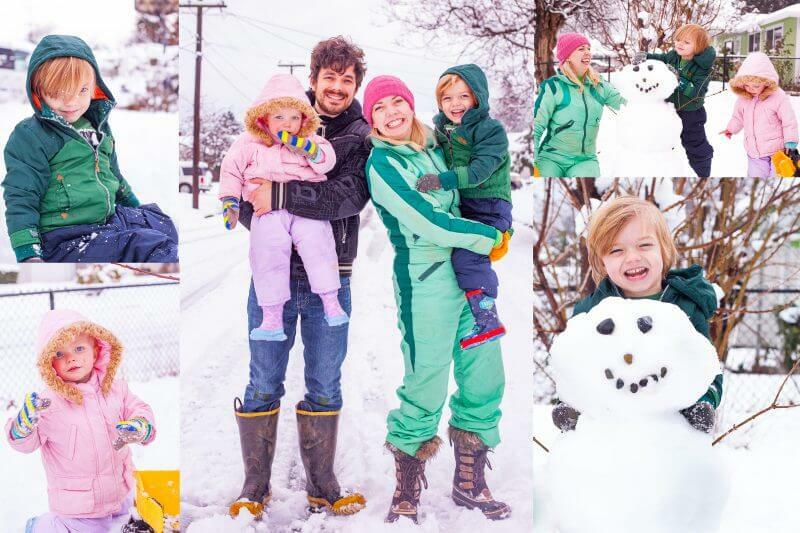 But every once in a while, we get a doozy of a snow day, and it’s pretty much our favorite day of the year! The memories of the day come in two parts. First is the excitement and fun of playing in the snow together. The second part is warming up inside with hot cocoa and sweet treat. 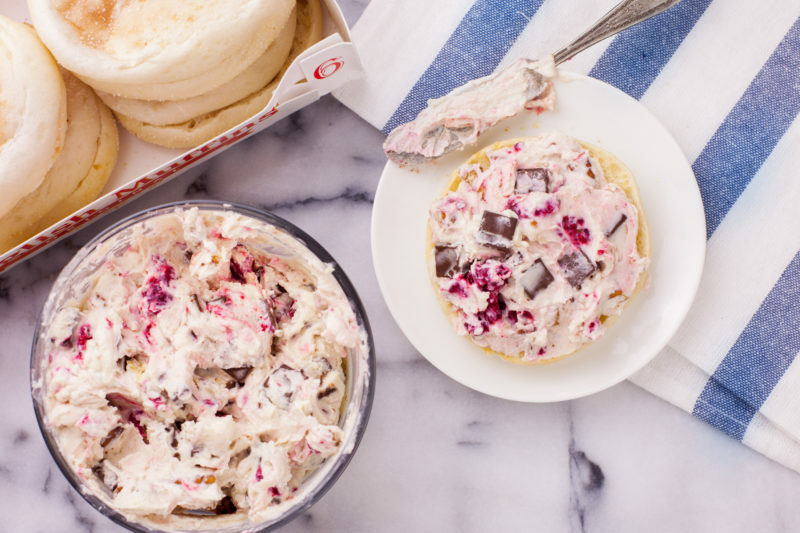 This chocolate raspberry cheesecake spread is made from goat cheese creamed together with maple syrup and vanilla extract. Then chunks of rich dark chocolate, chopped walnuts, and freeze dried raspberries are gently folded in for a creamy spread that’s simply irresistible. While we like our chocolate raspberry cheesecake spread for an afternoon snack, it also makes a GREAT holiday party dessert. 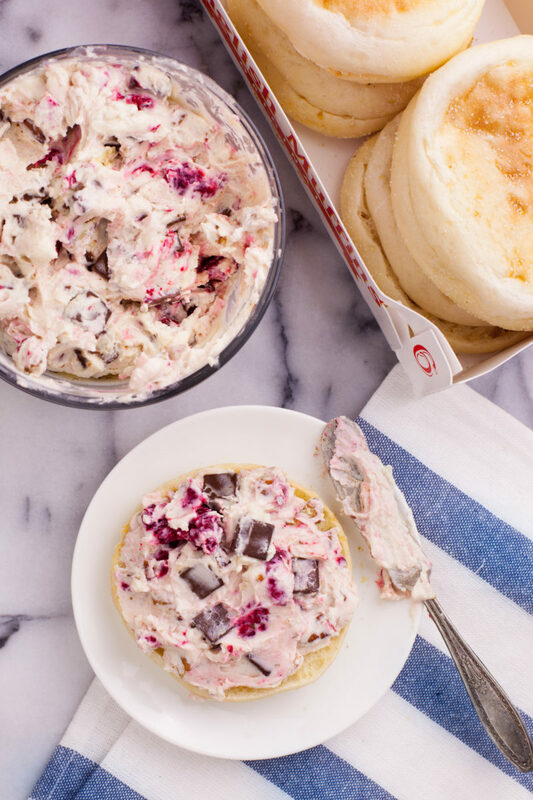 Just whip up a batch in minutes, and serve alongside a basket full of toasted Bays English Muffin halves. Don’t lose the recipe! Here’s a quick link to pin and save it. 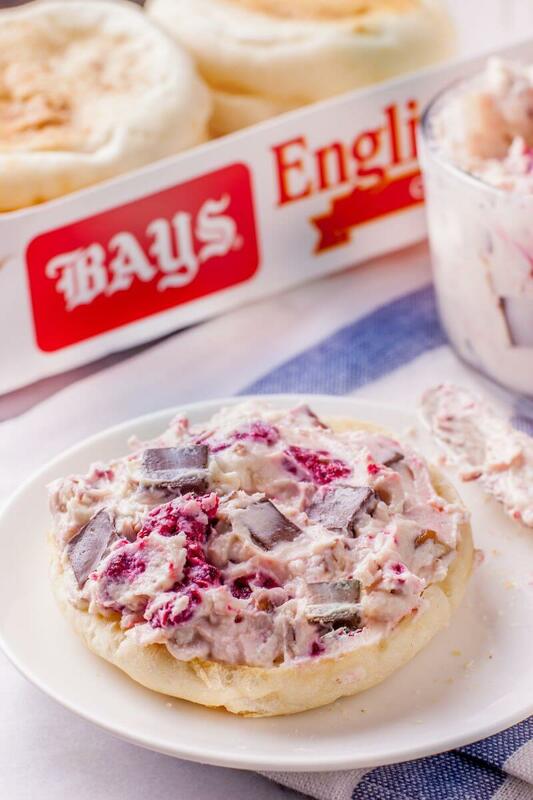 Want more great recipes using Bays English Muffins? Visit bays.com to get the following recipes. The classic French toast is next up on my list! Beat cheese, maple syrup, and vanilla in a medium bowl until well blended. Gently stir in chocolate, raspberries, and pecans. Toast English muffins, then spread cream cheese mixture evenly over warm muffin halves.